Stocks took a big fall on Monday but it's looking like they may claw back some lost ground today. 1. 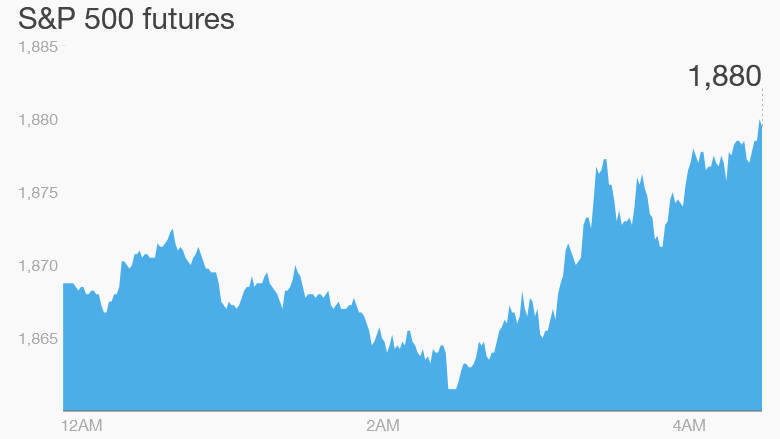 Market overview: U.S. stock futures are inching higher Tuesday, but global market sentiment remains cautious due to concerns about economic growth. "There's a great deal of investor concerns in the markets right now," said Jameel Ahmad, chief market analyst at FXTM. Top worries include slowing growth in China, uncertainty over when the Federal Reserve will begin raising U.S. interest rates, depressed commodity prices and "continual concerns over the pace of economic recovery in both Japan and Europe," noted Ahmad. European markets were mixed, and most Asian indexes skidded lower, led by a 4% plunge on Japan's Nikkei. On Monday, the Dow Jones industrial average fell 1.9%, the S&P 500 dropped 2.6% and the Nasdaq took a 3% hit, bringing its five-day loss to nearly 6%. 2. India rate cut boosts stocks: India's Sensex index was the exception in Asia on Tuesday, gaining about 1.5% after the country's central bank cut its key interest rate by 50 basis points. It was a bigger than expected cut, and the fourth by the Reserve Bank of India this year. The bank said risks to growth were rising. 3. Stock market movers -- Yahoo, Tesla, Glencore: Shares in Yahoo (YHOO) are up nearly 3% in extended trading after the company revealed plans to go ahead with its Alibaba (BABA) spinoff regardless of whether the IRS approves the plan. Shares in Tesla (TSLA) could be on the move Tuesday as the company is set to begin deliveries of its new Tesla SUV, dubbed the Model X. Shares in Glencore (GLNCY) are rebounding -- up about 9% in London -- after falling by 29% Monday. The mining and trading conglomerate has been crushed by falling prices for commodities and fears that China's slowdown will make matters even worse. 4. Economics: The latest Case-Shiller housing price index comes out at 9 a.m. ET, giving a snapshot of the health of the U.S. housing market. Then the Conference Board will update its Consumer Confidence Index with a September figure at 10 a.m. ET. 5. Earnings: Costco (COST) and Diamond Foods (DMND) are reporting quarterly earnings after the market closes.